New Directions Publishing Corporation, 9780811218696, 147pp. 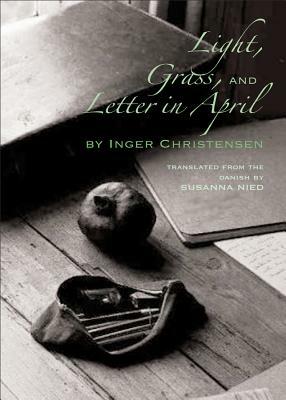 Light, Grass, and Letter in April is the first book in English to appear since the great Danish poet's death in January 2009. Light (1962) and Grass (1963), her first published works, introduce her genius for the music of everyday speech, and her approaches to the themes she'd pursue throughout her life: the primacy of nature, the enigmatic boundaries between the self and the other, and the role of language as a mediator between human experience and reality. Letter in April (1979), Christensen's most intimate book, examines love and loss, self and loss of self, echoing musical structures developed by the French composer Olivier Messiaen. It was written in collaboration with the Danish artist Johanne Foss, whose accompanying drawings helped to catalyze the poems.